The Great Escaper. 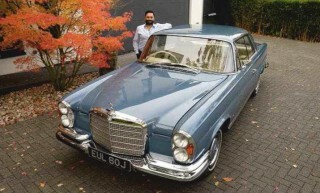 Jayesh Patel’s prototype V8 Benz evaded its maker’s crusher. Words and photography Paul Hardiman. 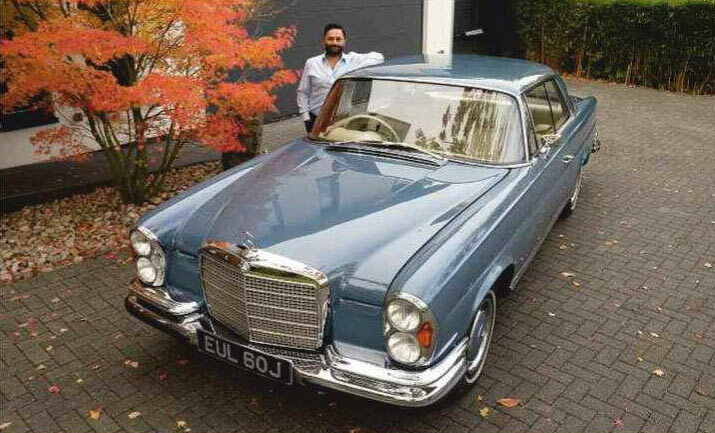 In the 1960s, Jayesh Patel’s father had a Mercedes in this 903 Blau colour, with a white steering wheel, which led Jayesh to this car after an internet hunt. And when he discovered its unique history, he couldn’t resist. It’s a pre-production V8 prototype that somehow escaped destruction at Stuttgart, and has documentation from the factory to prove it. Originally a straight-six, the Will coupe was re-engined in 1968 with the new fuel-injected aluminium M116 V8 by the factory’s experimental department. At one time it had air suspension, too. After 2000km of development it was sold on in 1971, a year after the production 280SE 3.5 appeared. It came to the UK with an owner who kept it for 35 years. ‘His company was just around the corner from where our family businesses have been for 40 years, in Southwark,’ says Jayesh. ‘thee Mercedes-Benz 3.5 Coupe has always been a passion of mine,’ he continues. ‘Aside from doing my bit for the environment by not buying new cars - ever since I had a 997 and had the inevitable problem with the IMS bearing - my main motivation is that they’re so beautiful, thee 280s were a lot of money but I found a 300SE W112 with a 3.5 engine, in Regency Red. That’s where my car collection started, five years ago, and it grew from there. ‘After that I bought an E-type in Scotland from John Cleland, and we drove it home, that’s what I swapped for this. It was at Greenside Cars in Norfolk, though Graeme Hunt had had it earlier. It was restored in 2007. ‘Its history is fascinating. It came off the line 50 years ago as a right-hand-drive 280SE, then went to the experimental department where they put in the V8, a new gearbox, different axles and the shallower grille, thee engine number includes V for Versuch, or experimental. Actual production of the 3.5 started in 1969. ‘It must have got sold through luck and connections. Mr Gower, the first owner in the UK, had a business associate who dealt with the factory.’ thee history file even includes a receipt from the Graf Zeppelin Hotel in Stuttgart, where the new owner stayed before driving the 3.5 home. ‘Its history reads like a Who's Who of Mercedes people, from Haynes to Edwards and S&S Motors. Unbelievably, in the ’70s it was looked after by the same company in SE1 who serviced our fleet of vans. Jayesh, who lives in a fascinating eco house, is an inveterate collector whose classics include a BMW 3.0 CSA E9, a Chevrolet Corvette C3, a Renault 5 Turbo 2, a Delta Integrale, a Continental R and a Porsche 911 964 Ruf Turbo. Plus - as Spen King intended - a Range Rover as his daily driver, ‘thee internet is an awful thing,’ he admits with a rueful grin. But you suspect that this Mercedes-Benz, which reminds him of his dad’s car, is a keeper.